In a dynamic industry like Information Technology or IT, it is important that we be prepared to analyze and assess the risks involved. 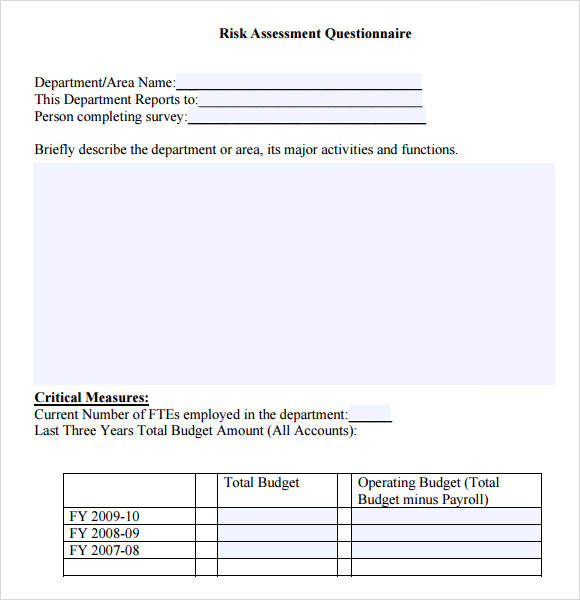 To help your organization or you (as a risk assessor) to analyze this, an IT Risk Assessment Templates is required. These risk assessment templates can only help you analyze the risks involved if you are able to key in primary details like the stock conditions, number of employees, employee overheads and others. The more information you are able to key in the better the risk assessment. 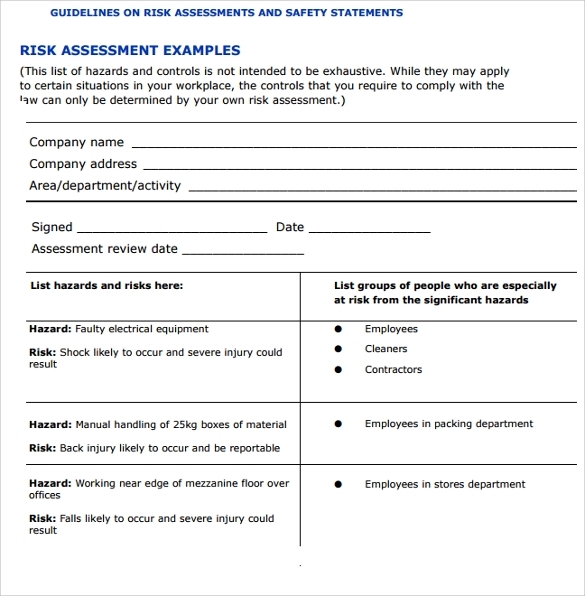 This risk assessment template can be easily downloaded and customized for a more optimum use. This template can also include important pointers like the objectives and the control objectives. If you want you can get a printed version of the template on the internet as well. Choose this sample as per your requirement. 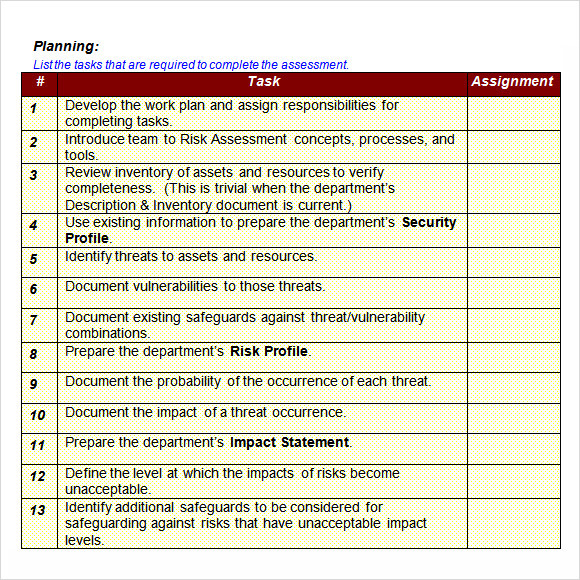 A pretty simple looking risk assessment template, the IT Security Risk Assessment Template is unassuming and includes important pointers like developing the work plan, introducing the team to the concepts of risk assessment and more. Usually this template comprises three columns – the first one is the serial number, the second one is the task and the last one is the assignment. 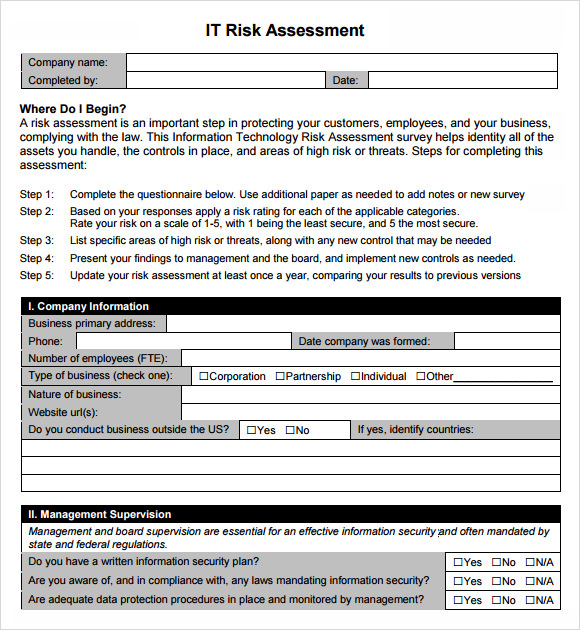 This kind of IT risk assessment template helps you to measure risks in IT risk areas. 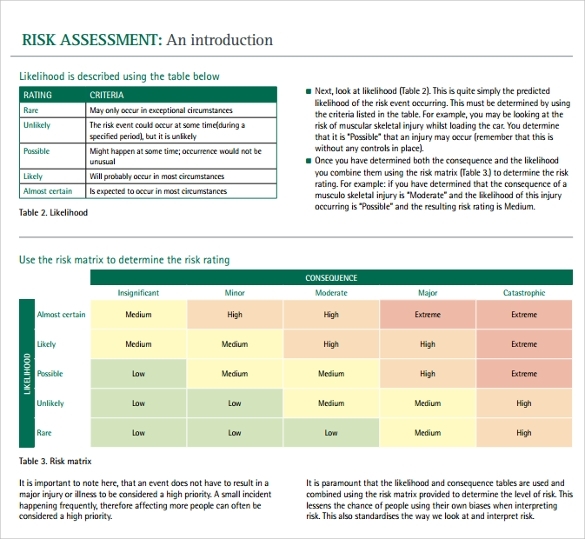 Important heads, like, what’s included in the risk area and the risk areas that are to be assessed are covered in this template. 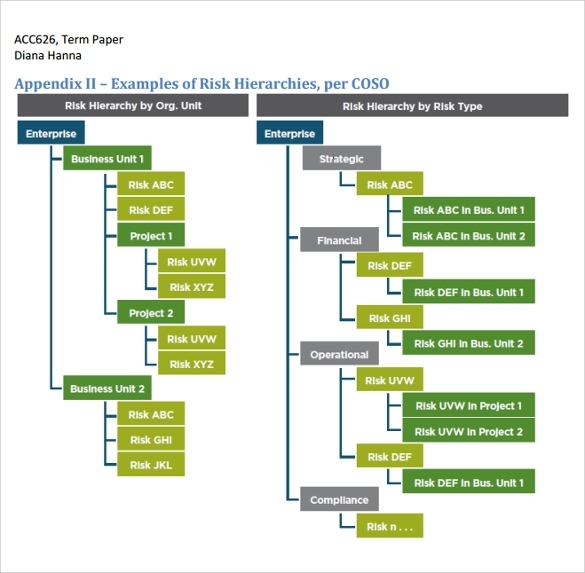 When outlining the risk area, generally processes that help IT to deliver services to end customers are covered, along with the information if the base is on existing frameworks like ISO, ITIL or COBIT. Where the risk areas to be assessed are concerned, what’s included are reliability and efficiency, human capital, consistency, technology leverage and more. 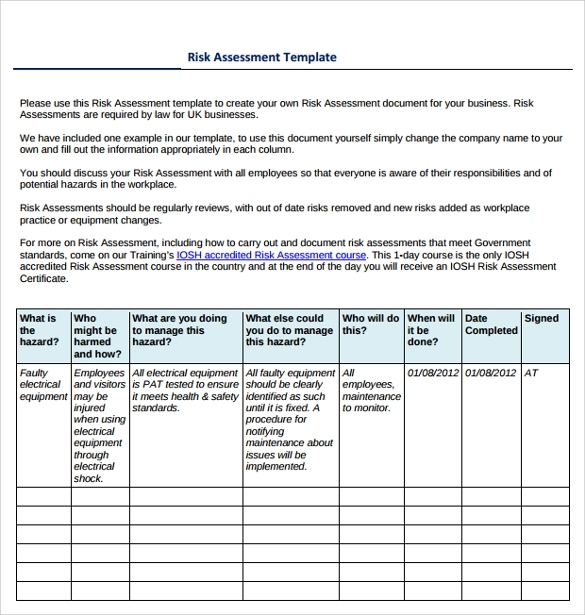 As the name suggests, this is a risk assessment template which is available in the PDF format on the internet, which in turn can help you to download it easily and use it as per your requirement. If needed, you can also customize as per the need of the hour. If you are more prone to using or working on MS Excel, this IT risk assessment template is the go-to tool for you. Easy to download on MS Excel format from the internet, this template uses a basic format. The format includes the risks, domains and policies. For example – if the risk is integrity, the domain can be the user interface and the policy will be proper segregation or division of data. 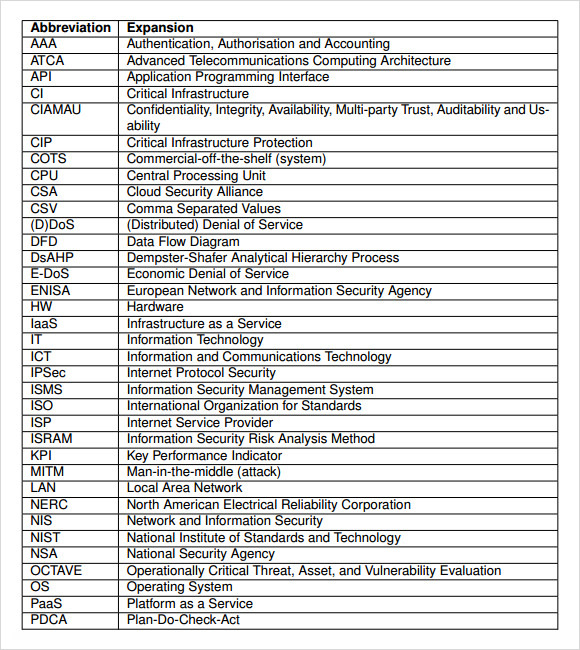 The IT risk assessment methodology template essentially looks like a table of abbreviations. On the left of the template is the column of abbreviations such as AAA, ATCA, CI, CIP and as such and on the corresponding column are listed the expansion of these abbreviations, for example Authentication, Authorization and Accounting for AAA, Critical Infrastructure for CI and Critical Infrastructure Protection for CPI and more. 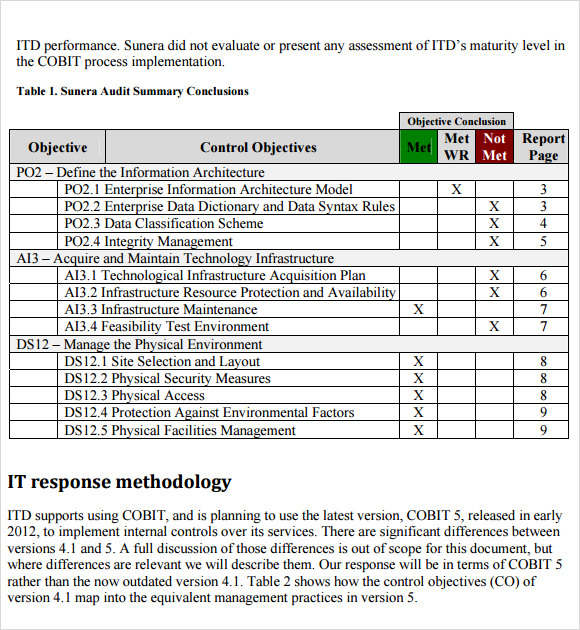 This template outlines the technology services and the COBIT Maturity Model. 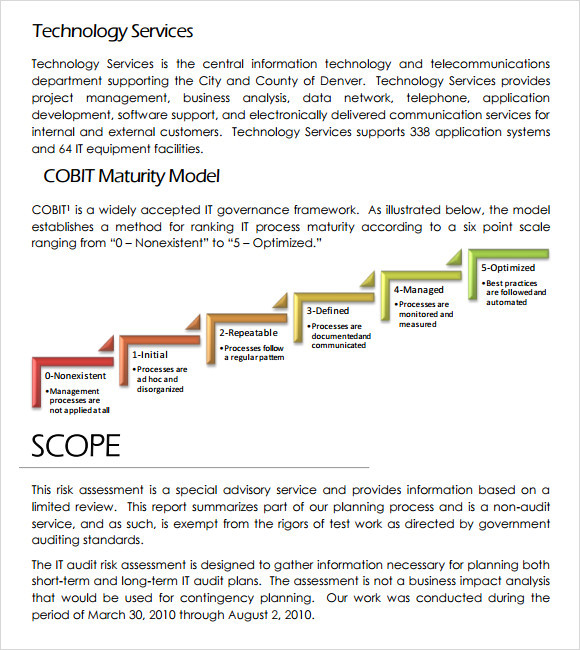 A globally accepted framework of IT governance, the COBIT model outlines or establishes the method of ranking the maturity of IT processes on a scale of six starting with 0, which is counted as non-existent to 5, which is counted as optimized. This template is exactly how a questionnaire is. It usually contains the name of the department or area. The name of the person the department reports to and the name of the person who completes the survey. The questions on this template/questionnaire range from briefly describing the department or the area and the major functions and activities to the critical measures involved. The critical measures can either be the present number FTEs involved or employed in the department and the budget for the last three years (for all accounts). 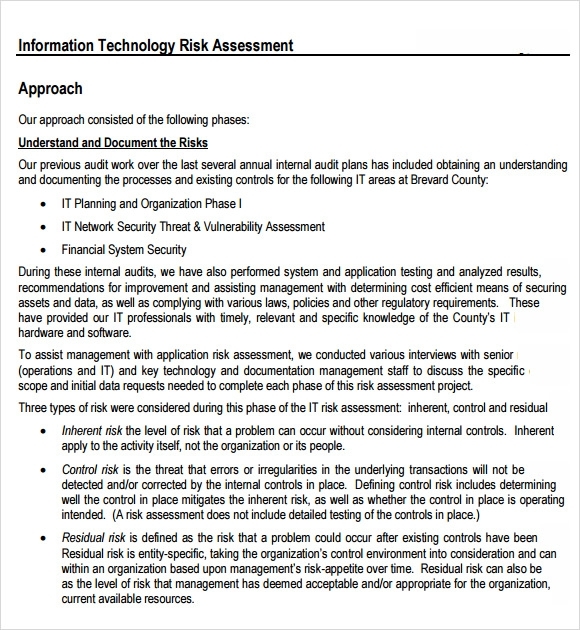 This IT Risk Assessment Templates outlines your approach and the phases it consisted of. Usually the phases can be IT planning and Organization, IT Network Security Threat Vulnerability Assessment and Financial System Threat. The types of risks considered during a said phase of risk assessment can be of three types – inherent risk, control risk and residual risk. When trying to identify, plan and mitigate IT risk, these templates can help you achieve the desired result and success of assessing, or better than that, averting the risk.